Indian music label T-Series and Swedish YouTuber PewDiePie (aka Felix Kjellberg) are in a neck-and-neck YouTube supremacy race. The T-Series vs. PewDiePie battle, which has been ongoing for the past few months, has attracted a lot of controversy owing to the methods adopted by PewDiePie fans to help the vlogger maintain the lead. The battle has been ongoing for months now, and has grown more intense as the days pass. Over the past few days, it has been touch-and-go for both. PewDiePie has been the top YouTube channel for years now. However, on Wednesday, T-Series had about 90.394 million subscribers compared to 90.387 million for PewDiePie. Later in the day, PewDiePie came back to take the lead with about 90.4 million subscribers compared to 90.396 million for India’s music channel. Then on Thursday, T-Series clinched back the top spot again, but soon lost it after PewDiePie tweeted “This is not the end.” PewDiePie was able to maintain the lead on Thursday with about 90.682 million subscribers compared to 90.654 million for T-Series. As of this writing, PewDiePie still leads the race but the margin is getting narrower. Currently, PewDiePie has over 90.74 million subscribers compared to just below 90.74 million for T-Series. This latest seesaw in subscriber count follows a bizarre incident, where the attacker involved in the New Zealand mass shootings urged in his Facebook live stream to “subscribe to PewDiePie.” Not many were surprised hearing PewDiePie’s name in the stream as the YouTuber has long been criticized for making anti-Semitic jokes and using racist language. The controversies and media attention that this T-Series vs. PewDiePie battle has generated has put the two channels well ahead of the next closest channel – 5-Minute Crafts with 52.1 million subscribers. This T-Series vs. PewDiePie battle is being closely watched by the YouTube community. Many don’t see this battle as a competition between two YouTube channels, but rather a YouTube culture war between individual content creators like PewDiePie and corporate (such as T-Series). 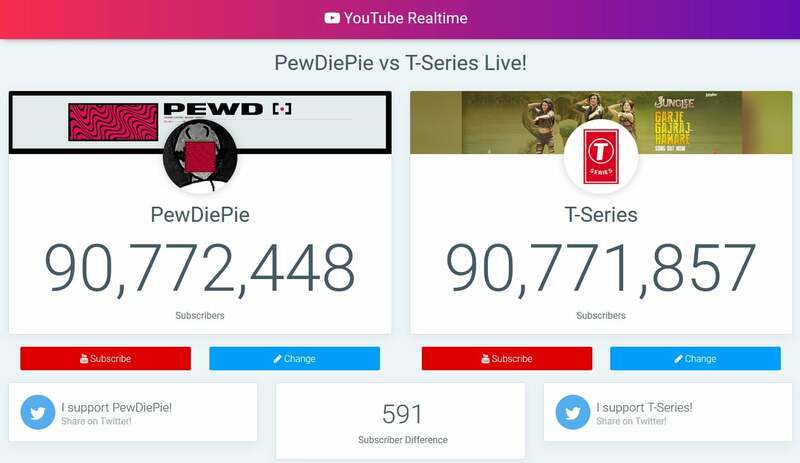 In this T-Series vs. PewDiePie battle, PewDiePie fans have made aggressive efforts to help their favorite channel maintain the lead over the Indian music channel. Previously, YouTuber Justin Roberts revealed that he purchased a Times Square billboard for $1 million to promote PewDiePie. Another popular YouTuber Jimmy Donaldson (popularly known as MrBeast) created a 12-hour video, where he recited “PewDiePie” 100,000 times. Some PewDiePie fans even hacked the Wall Street Journal’s website, Chromecast, smart TVs and printers to promote the “support for PewDiePie” campaign. One fan even created a Twitter account, which sends alerts whenever the subscriber difference between the two drops below 10,000. After several verbal attacks from PewDewPie’s side, T-Series owner Bhushan Kumar jumped in with a #BharatWins campaign on social media. The campaign encouraged people to make T-Series the top YouTube channel in the world. “There is an Indian YouTube channel on the brink of becoming World’s No.1. It has taken us a lot of effort to come this far.….let’s come together and subscribe to T-Series YouTube channel and make India proud,” Bhushan said in a tweet earlier this month. Following this tweet, many Bollywood celebrities, including Salman Khan, also endorsed the Indian YouTube channel asking users to subscriber to it on YouTube. PewDiePie is known for his opinion on gameplay videos and internet culture. He became the top YouTuber in August 2013 after overtaking then-leader Smosh. PewDiePie was heavily criticized in 2017, when he paid two people in Sri Lanka (via crowdsourcing platform Fiverr) to hold a sign reading “Death to All Jews” and “Hitler did absolutely nothing wrong.” At the time, PewDiePie defended himself, saying he was trying to show that people will do bizarre things for money. He later deleted those videos and apologized. On several counts, PewDiePie has also attracted controversy over racist language. For instance, in December he recommended an anti-Semitic video channel. Later, he apologized for his mistake, saying he wasn’t aware of the channel’s previous videos. T-Series introduced its YouTube channel on March 13, 2006. The channel has about 29 sub-channels and shows song film trailers.